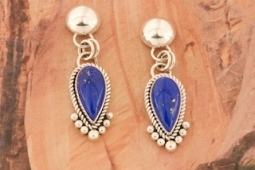 Genuine Blue Lapis set in Sterling Silver Post Earrings. Each Sterling Silver Bead is made by hand. Created by Navajo Artist Artie Yellowhorse. Signed by the artist. Earrings are 1 5/8" L x 1/2" W.